Since we want our children to store up Bible verses in their heart, we memorize verses from an early age. As the child gets older, the passages become longer. 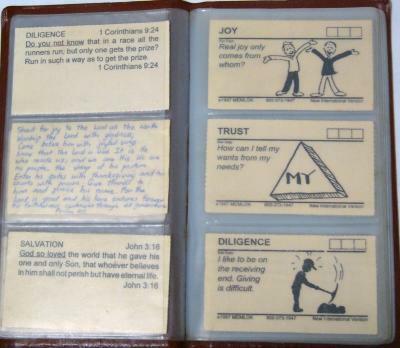 We have always used small cards (the size of business cards) to help us memorize the verses and passages. These cards can be made or bought. We have a combination of bought and home-made cards. The Memlok Bible System has been very useful to us. On the front of each card there is a memory trigger in picture form and on the back is the verse. Every week, the children add new verses to their booklets and remove ones which they know completely. We either go through the Bible verse at meal times or at our special "Memorization Time." To keep the cards organized for each child, I have bought a cheap Business Card Holder. This has been a terrific way to keep the cards organized for each child! The children slot the cards in their holder and I print their name on the cover. On the front of the card, they see the picture which triggers off the memory and they can check it on the back. Return to Homeschool Ideas- Bible.